The Vic Park Finish Line is the only place where you can watch the Southern 80 from start to finish. $35 will get you a full weekend pass to the finish line, exclusive access to live footage and commentary on the giant screen across both days, the best seat in the house as the teams cross the glory line, awesome boat displays, children’s play area and much, much more. Tickets can be purchased online or at the gate. If you like camping here is some information to make your camping experience enjoyable for yourself and people around, whilst looking after the natural bush around you. There are many places to camp on the river between Echuca and Torrumbarry. Check out the Parks Victoria website for further information. Fires are not permitted in any NSW parks. Fires are permitted with conditions on Parks Victoria land. 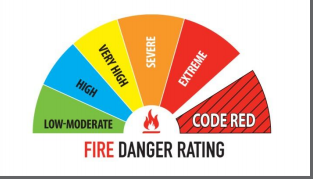 Be aware of the Fire Danger Rating for the day. Be informed about local conditions and download the Vic Emergency App to keep up-to-date with all weather alerts and warnings across the entire Southern 80 weekend. We work closely with Victorian and NSW police, NSW Roads & Maritime Services and all other emergency services to ensure everyone stays safe, while having the time of their lives. If you’re camping along the Murray River during the Southern 80 be sure to take any rubbish with you. Or you can deposit it at the temporary Transfer Station on O’Dwyer Road or the Echuca Transfer Station on McKenzie Road. Dumping rubbish in our parks is not just unsightly but also potentially dangerous for visitors, and impacts on native plants and animals. Leave the river and bush clean so everyone can enjoy it! You could also arrange between a number of campsites to have a toilets and / or a skip bin delivered to your site. It has been a dry summer. Many of the bush tracks are dusty. Please keep travel along the bush tracks to a minimum and at a slow speed. If there is lots of dust in the air, this may travel onto the river and impede the competitors on the water. The race may then need to be stopped. Please be mindful of others and keep your travel on the bush tracks down a minimum. 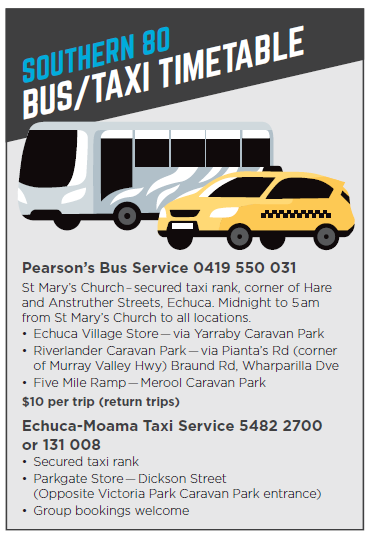 Saturday night, there is a bus service which picks up from selected spots along the river for a small cost. Basically from Perricoota Marina (Goldsbourgh Rd) to Torrumbarry is open. Otherwise we have exclusive use all day 7am to 7pm. Sunday the whole river from Torrumbarry to Echuca is closed water. Those familiar with the Southern 80 will be aware that the Murray River is closed to the public during race times to ensure safety for both competitors and spectators. Much work is done behind the scenes to ensure this is done efficiently and effectively and the Moama Water Sports Club has developed a map to ensure everyone is up to speed with river closures from 6am until 7pm on both days of racing. Campers along the river will be familiar with the sweep boat, which travels along the course prior to racing to mark the official closure of the river by flying a red flag and then again after the day of racing to officially reopen the river to the public by flying a green flag. Please keep a close eye on any inflatables. If they float away on the river they will cause a hazard and could potentially stop the race. This has happened in the past. No person is permitted in the river during Southern 80 race times. (9am-6pm). Enter the water on race day – no way! It is for everyone’s safety that there are barriers in the water at the finish line. This is for the spectators and crews competing alike. This rule was brought in, as some spectators were in the water whilst the boats were travelling on the water. We want everyone to enjoy the spectacle of the Southern 80. Don’t be the person to stop the race by being in the water! Be aware of the rules regarding the flying of drones. Have you checked out this video?